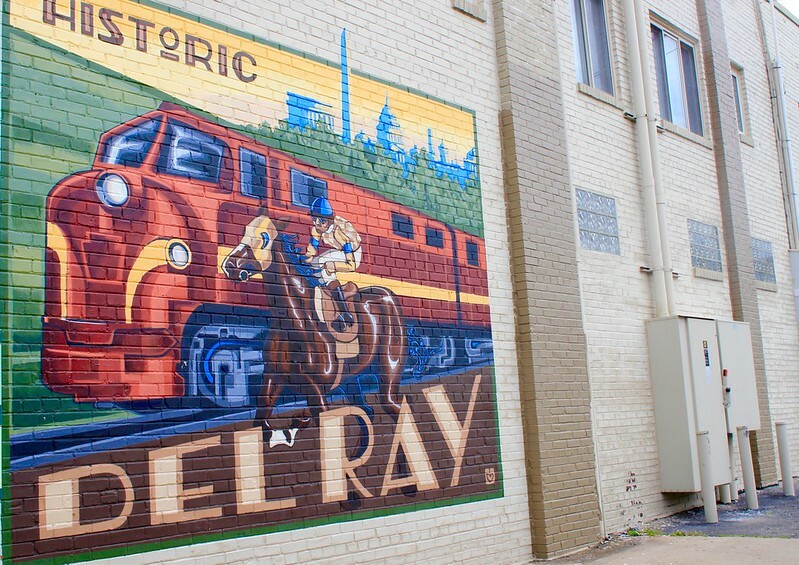 The other day, my daughter and I went on a mural tour of Mount Vernon Ave. in Del Ray. 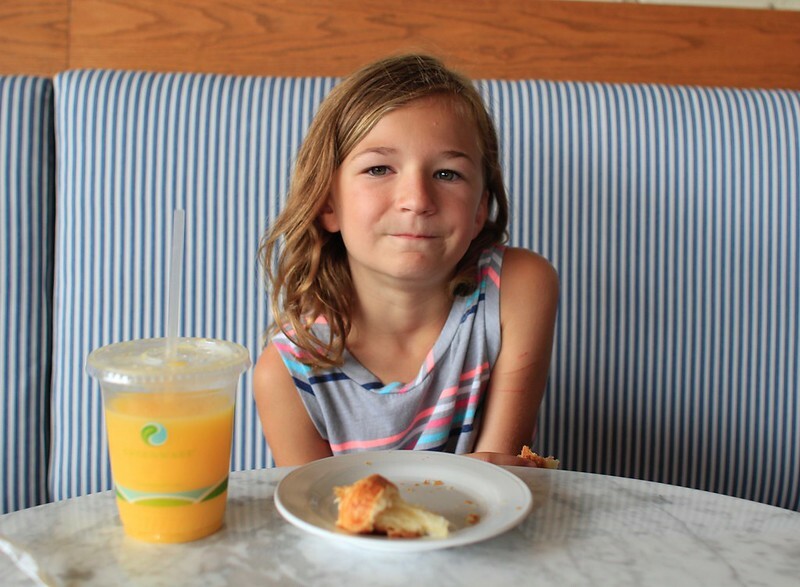 We fueled up at Junction Bakery before our trek along the Avenue. 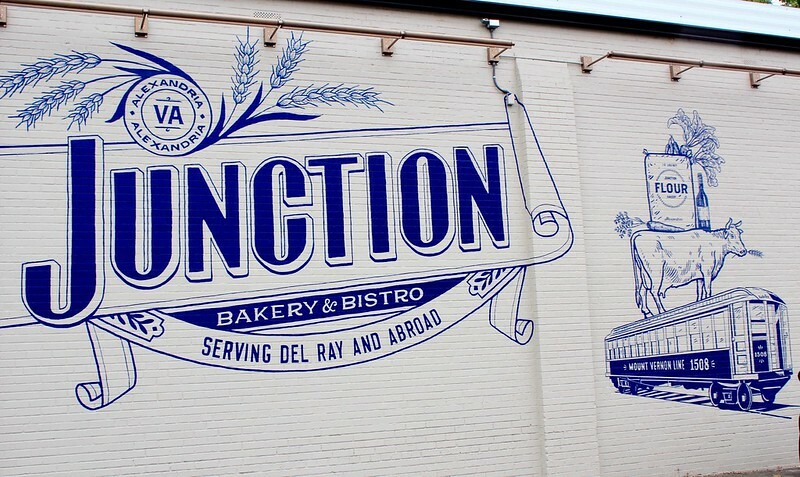 Junction Bakery’s mural is the newest mural on the Avenue. There are two murals that were painted when there was an antique store where Walgreen’s is now. They still remain on the side of the building. 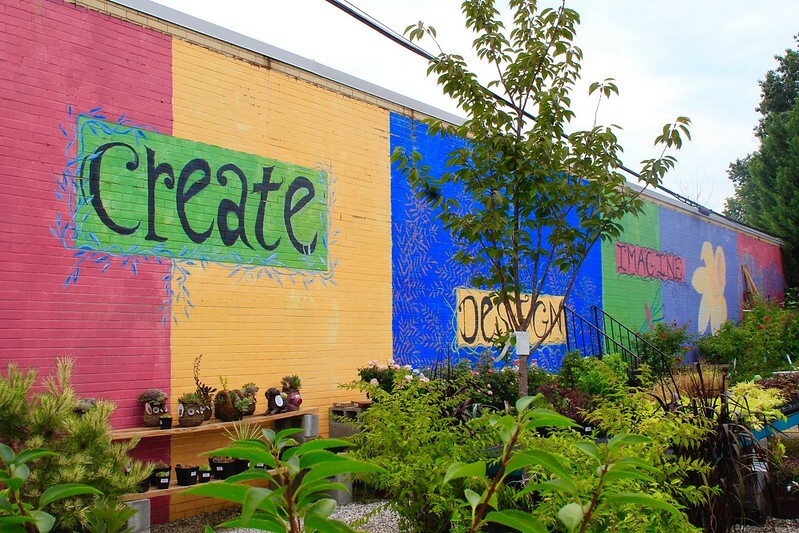 The mural at Greenstreet Gardens is large and expansive and a beautiful backdrop to their plants. The mural on the side of Velocity is a nod to Del Ray’s Farmers’ Market. 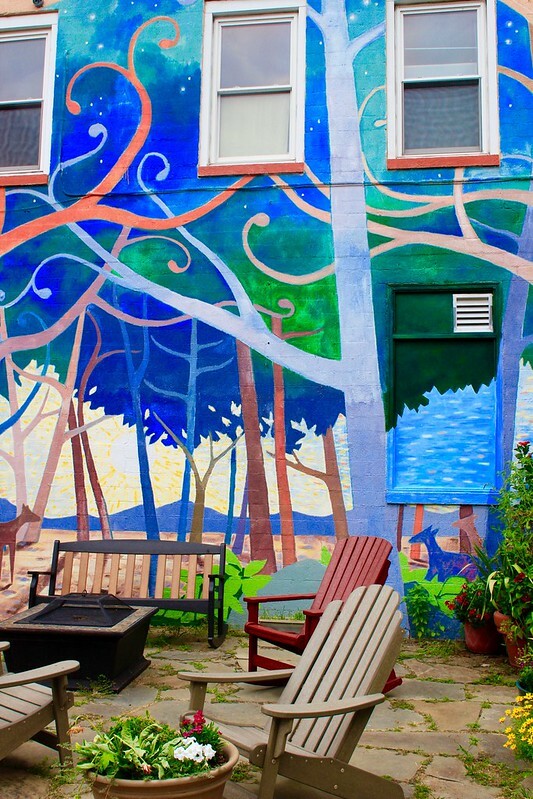 Your Dog’s Best Friend has a mural that seems to flow seamlessly into their outdoor sitting area. 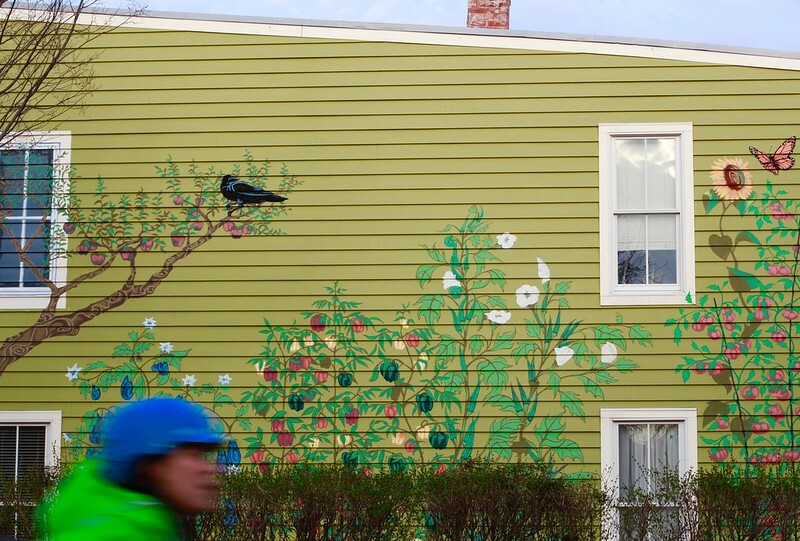 The mural on this beautiful home at the corner of Windsor Ave. catches everyone’s eye. 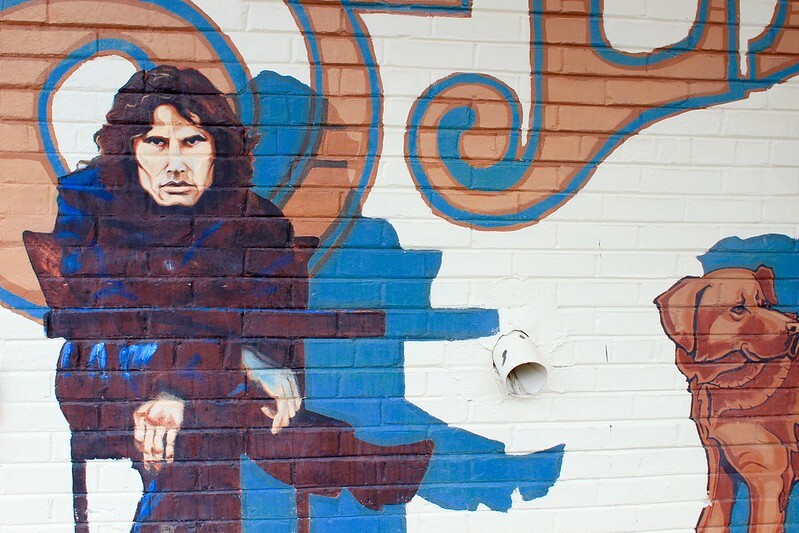 St. Elmo’s mural pays homage to one of our neighborhood’s most famous former residents, Jim Morrison. The Cheesetique mural reminds us of the neighborhood’s history with the railroad. 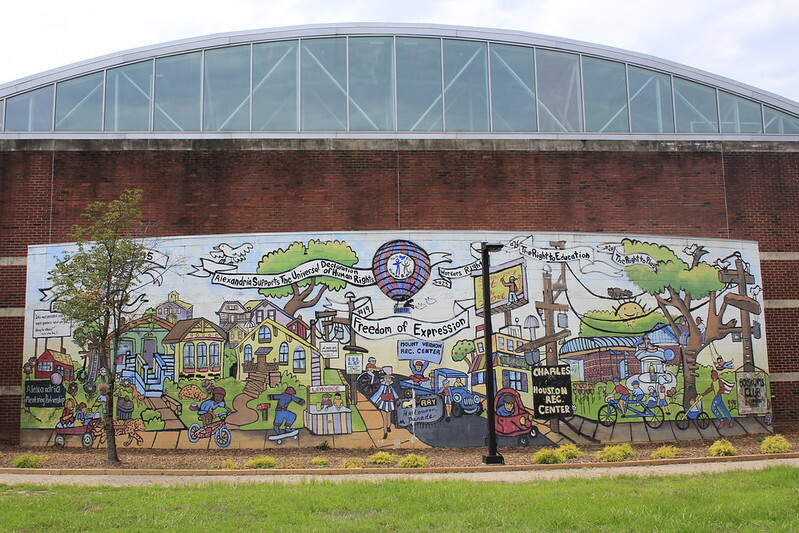 The Mount Vernon Rec Center was a mural made by families in the community during Art on the Avenue several years ago. 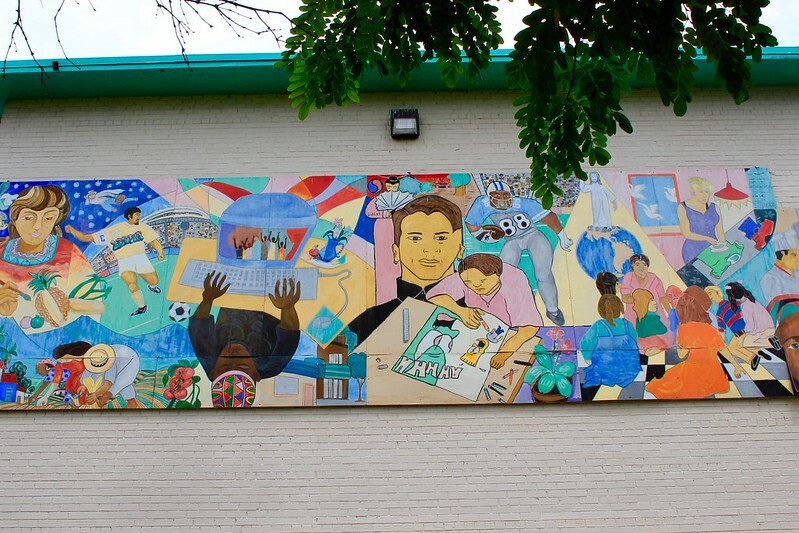 My kids Miles and Vivien and I worked with Art teacher Sara Lovelace to create the mural on the side of Mount Vernon Community School. 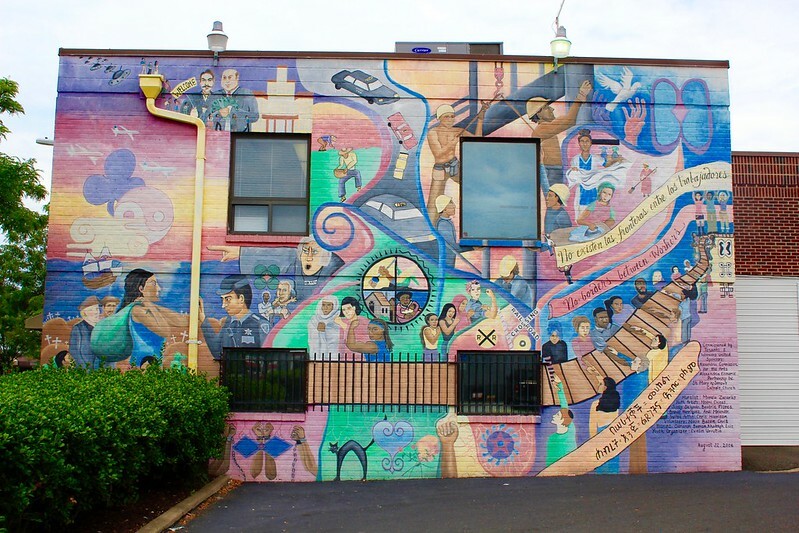 The Tenants and Workers United Mural is an expression of the struggles of our immigrant community. This apartment building mural is located across from MOM’s parking lot. 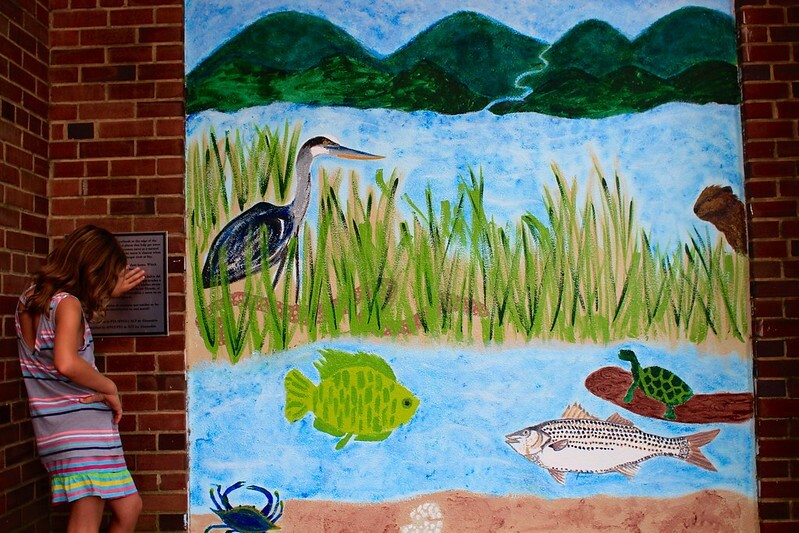 And finally, MOM’s mural expresses their dedication to the environment. Did I miss any in the neighborhood? Great article Justine and kids!!! The muralist who painted the mural on the building that’s now the Walgreens is the same painter who painted the mural on the side of the house across from the Thai restaurant AND who painted the mural on St. Elmo’s Café. He also painted the mural inside the Caboose (which never got finished because the ownership changed… many years ago). While he was painting the St. Elmo’s mural, I talked with him and said he should have included Mama Cass of the Mamas and the Papas. She grew up in Alexandria (Ellen Cohen was her birth name), and my sister was good friends with her sister, Leah. (I knew her brother, Joey, a little bit.) 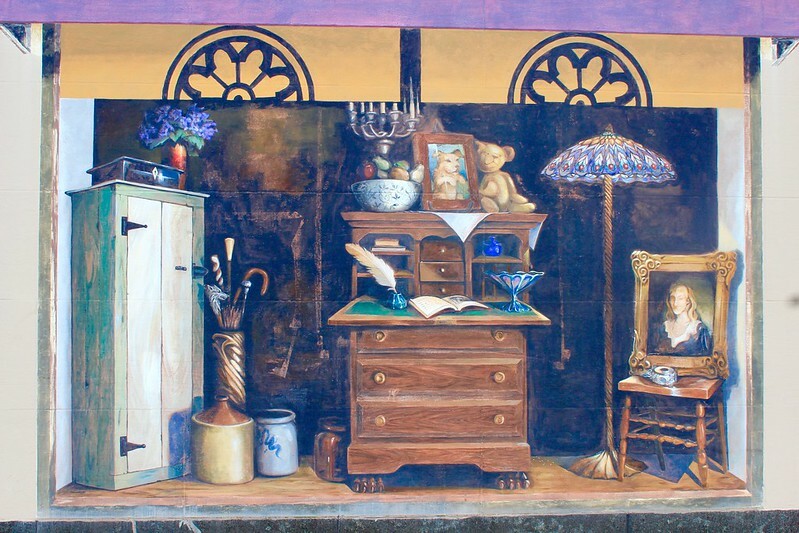 The muralist (can’t remember his name, but the Heimbergs with the corner house with the trompe l’oeil window mural can tell you) said he wished he’d known Mama Cass was from Alexandria; he’d have included her in the mural. John Phillips, also in the mural, lived in Alexandria. I know Joan Baez has frequented Alexandria to perform at the Birchmere, and she was here celebrating Obama’s 2008 victory. 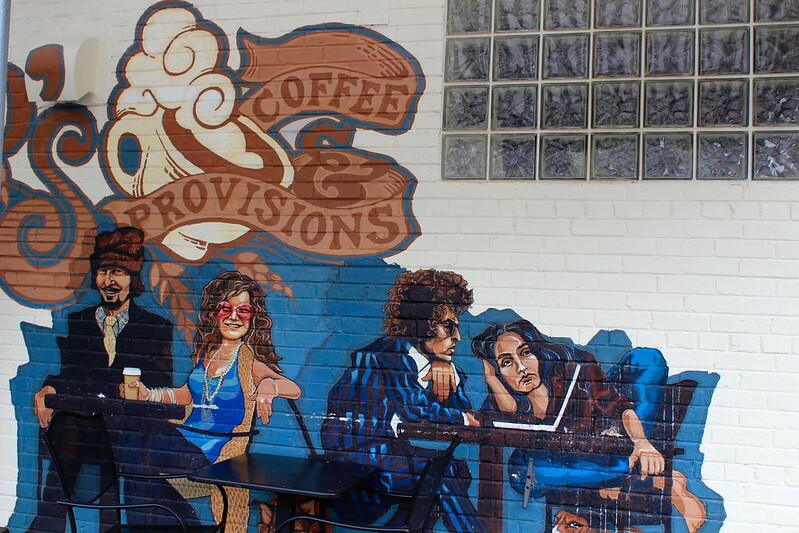 Not sure about Bob Dylan, but he’s probably performed at the Birchmere. (Anyone know?) I didn’t want to keep the muralist from his work, so I didn’t talk with him long. Very interesting….. ‘Glad you added to Justine’s story. — Alexandria is definitely a special area. I read your lovely comment. Thank you. But what became of the coolest of them all? 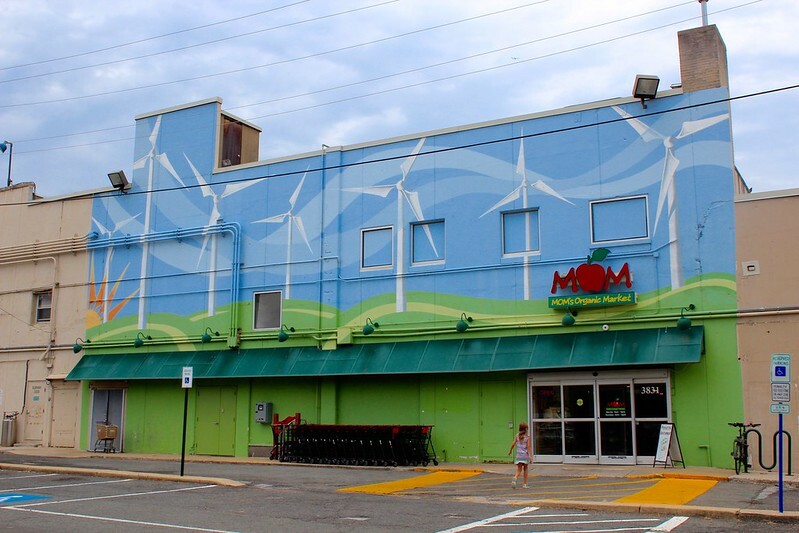 The 20 yr old interior Mancinis sunflower mural … Was it salvaged? No, unfortunately. Only in pictures will you see it again. The ones inside St. Elmo’s were also painted over. It was above the window wells, they were of a jungle which included birds, monkeys, flora and fona. Coffee grows in that type of enviorament in the wild. 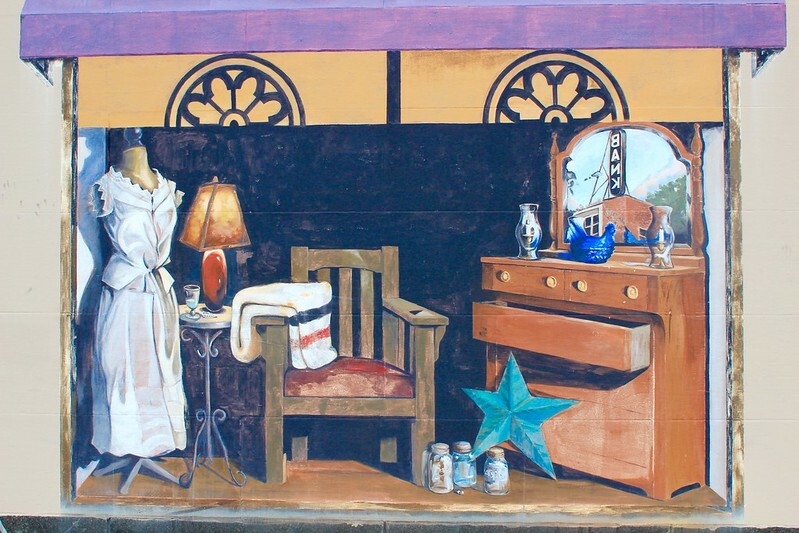 It was done by Chad Brady who was the first muralist in Del Ray now living in Wyoming. There is also a mural on the backside of the used Hyundai dealership. It’s good to have documentation of all of this urban art. Does anyone know of a local artist who might be willing to paint a mural on the side of our garage? 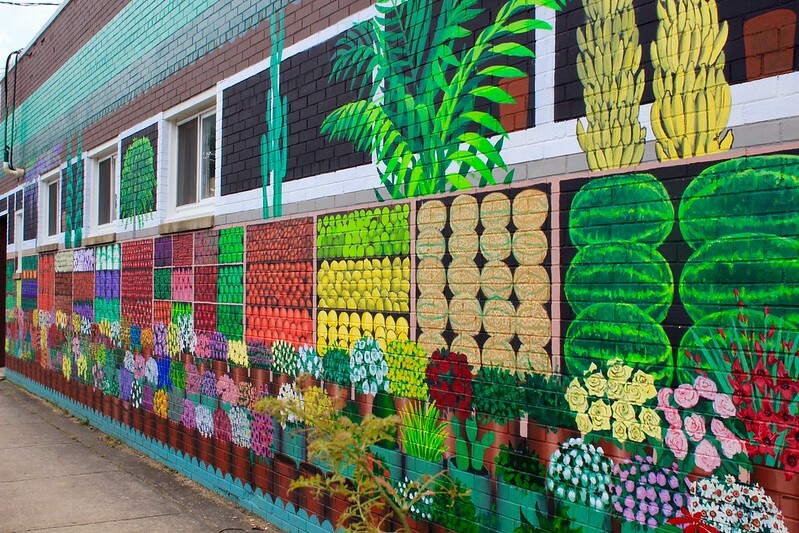 I’d love to have a garden scene (sort of like the one on the house across from Thai Peppers), but haven’t had any luck finding someone to look at the wall and talk numbers with us. Any suggestions would be most welcome! Thanks Benjamin! I’ll give you a ring later this week.